It's about to be 2015. We still don't know where a plane is, exactly, when it's in mid-flight; we don't have accurate passenger lists for ferries travelling between two sophisticated maritime countries, and as for dubious ships wandering the eastern Mediterranean, we don't seem to know -- or care -- at all about who's on them. It is revealing that when star conservative intellectual Yuval Levin cites an example of "cronyism" in the end-of-year budget legislation, it's related to the hated (for him) Obamacare law, and by the way, it's a provision that benefits Blue Cross/Blue Shield, which provides health insurance to over one-third of Americans -- some cronies! (3) by amending subsection (d) [of Dodd-Frank] to read as follows: ``(d) Only Bona Fide Hedging and Traditional Bank Activities Permitted.-- ``(1) In general.--The prohibition in subsection (a) shall not apply to any covered depository institution that limits its swap and security-based swap activities to the following: ``(A) Hedging and other similar risk mitigation activities.--Hedging and other similar risk mitigating activities directly related to the covered depository institution's activities. ``(B) Non-structured finance swap activities.--Acting as a swaps entity for swaps or security-based swaps other than a structured finance swap. ``(C) Certain structured finance swap activities.--Acting as a swaps entity for swaps or security-based swaps that are structured finance swaps, if-- ``(i) such structured finance swaps are undertaken for hedging or risk management purposes; or ``(ii) each asset-backed security underlying such structured finance swaps is of a credit quality and of a type or category with respect to which the prudential regulators have jointly adopted rules authorizing swap or security-based swap activity by covered depository institutions. That's a provision that weakens an element of the Dodd-Frank banking regulation law which would have restricted the type of derivatives trading that deposit-taking banks can conduct; the amendment was a gift to banks with large investment banking operations. The list of trading that is now allowed -- as above -- is wide enough to get many of the good old pre-2008 stuff through. Now that's cronyism! Levin's apparent blindspot on the financial sector is also evident in his Brooks-lauded First Things essay Taking the Long Way to Liberty which talks about all sorts of ways that society should have disciplines and constraints to be truly fulfilling, including that the poor should work, but not a word about the corrosive effect of huge returns to ethically and economically dubious financial activities. Let’s start with a tale from overseas: austerity policy in Britain. As you may know, back in 2010 Britain’s newly installed Conservative government declared that a sharp reduction in budget deficits was needed to keep Britain from turning into Greece. Over the next two years growth in the British economy, which had been recovering fairly well from the financial crisis, more or less stalled. In 2013, however, growth picked up again — and the British government claimed vindication for its policies. Was this claim justified? 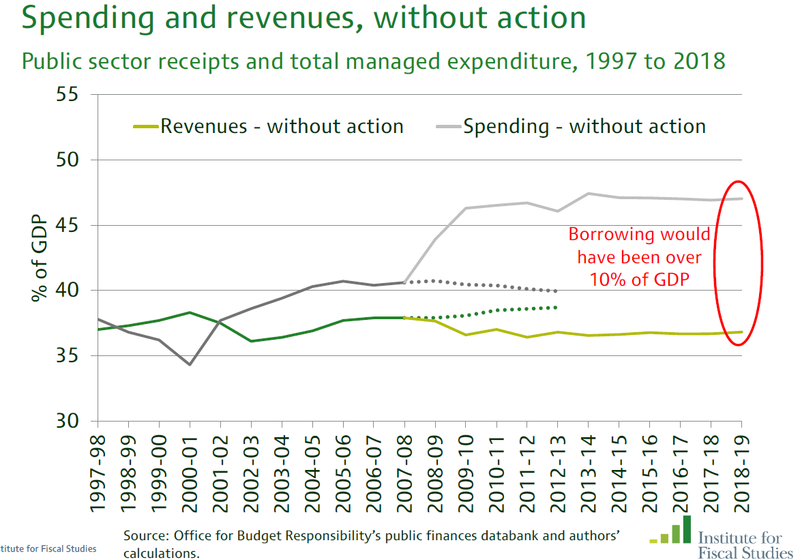 The chart above is from an Institute for Fiscal Studies analysis of UK fiscal policy since 2008. IFS is widely respected. The story is very simple. There has been a significant slowdown in the UK trend rate of growth, which appears to date from the 2008 financial crisis and not the later move to austerity. UK public spending is set disproportionately in cash terms (health spending, welfare, pensions, salaries) while revenue is generally set as percentages, which ultimately means percentage of the economy. So if you're setting spending in cash but revenue in percentage of something that's growing more slowly, you've got a big problem over time. That's what the IFS chart shows: the gaps between the lines was getting very large, very quickly. The point is that the Tory/LibDem coalition was not being completely loony in thinking spending policy would have to change. The timing was not great, but the damage could be offset by the Bank of England, and over time interest on growing debt was itself going to squeeze spending even in the absence of discretionary cuts. As the IFS has been pointing out, the same fiscal logic is boxing in whoever wins the May election. The point isn't that Krugman is wrong. It's that the push for austerity wasn't coming from long-dead economists or that there were lots of choices. And it's worth acknowledging the surprise of how well the UK economy has held up despite the austerity still in the pipeline. UPDATE: This Matthew Yglesias Vox piece is very useful as a contrast in showing how the US was able to achieve very large cash adjustments to its budget in a short time, something that is much more difficult for the UK to do since it runs a tighter ship on health to begin with and other spending commitments are embedded in policy. We found the Khorasan Group! Remember that mysterious group which the Pentagon was proclaiming it was targeting in its bombing raids on northern Syria but no one else had heard of, and it actually seemed to be Al Nusra Front, which spends most of its time fighting Bashar al-Assad? Well, the good news is that the general skepticism about there being a group called Khorasan was unjustified. In a house on the outskirts of Baghdad, a Shi'ite tribal leader sat and imagined his world as "a dark tunnel with no light" at its end. "Iraq is not a country now," he said. "It was before Mosul." The sheikh, who spoke on condition of anonymity, would like to see his country reunited but suspects Abadi is too weak to counter the many forces working against him. Now the Shi'ite militias and Iran, whom the sheikh fought in the 1980s, are his protectors. It is a situation he accepts with a grim inevitability. "We are like a sinking ship. Whoever gives you a hand lifting you from the sea whether enemy or friend, you take it without seeing his face because he is there." Iranian-advised paramilitaries now visit his house regularly. He has come to enjoy the Iranian commander of a branch of the Khorasani Brigades, a group named for a region in northeastern Iran. The commander likes to joke, speaks good Arabic and has an easy way, while other fighters speak only Persian, the sheikh said. He expresses appreciation for their defense of his relatives in the Shi'ite town of Balad, which is under assault from the Islamic State. Goldman Sachs arranged and participated in an $835 million loan channeled via a Luxembourg-registered special purpose vehicle to a Portuguese bank -- Espirito Santo -- that was about to go bust; the loan in turn was backing an oil refinery project -- the price of oil about to crash -- in Venezuela -- a country on the verge of default. Somehow, that loan made it into the liabilities of the "good bank" that the government of Portugal created when it broke up Espirito Santo. The Wall Street Journal, (free link) which has been all over the story from the start, now reports that common sense has prevailed and the loan is being dumped into the bad bank, which probably can't repay it. Goldman is of course lawyering up. It took a long time, but Europe's bank regulators might finally be on the level of who they're dealing with. Experts predict a growing number of tourists on the territory of the Russian Federation this year. Therefore, together with the regions we are focussing on all the possible traditional holidaymaking locations. "It is not a muscle injury," he said. "It is more the pelvis does not have the right relationship with the leg." Apparently, judging by the Daily Telegraph, declines in barometric pressure in winter North Atlantic low pressure systems are now "weather bombs." But remember the official line on the anti-ISIS airstrikes is that they are not in any way facilitating the Assad regime. Her father looks out into the court and inclines his head towards the microphone. “My daughter’s dead,” he says softly. “I just want her to have dignity, to be put to rest.” To his right, three judges, headed by Mr Justice Nicholas Kearns, their expressions serious and solemn. To his left, 17 lawyers, squeezed into three rows of seats, and a public gallery filled with more barristers, some doctors and a smattering of onlookers. It's a bonanza for the legal class. For everyone else involved, it's a miserable Christmas. This is not the only example of Ireland's over-deference to its legal profession. UPDATE: The High Court ends the madness. The minister [of Information] said that the cabinet discussed a number of topics on local affairs and reviewed what is going on in the petroleum and international market of incidental problems, reiterating that the economy and industry of the Kingdom are capable of bearing temporary fluctuations in oil income and considering them as normal, and it emphasizes that what it is doing will achieve the best results for the Kingdom, and it is continuing in its balanced policy in a strong and firmly manner relying on Allah Almighty and then the wise leadership, strong economy and strong global petroleum industry. It's probably not a positive for oil prices that they were clear that Allah will be the prime determinant of policy. Yesterday's murder of two New York Police Department officers is inevitably been seen as a New York City story, which among other things has to do the heavy media presence in the city in general, and the Fox News presence in particular -- the story is being packaged with not so subtle messaging about its link to protests against recent deaths at the hands of police. But anyway, it should be seen as a story as much about Baltimore as Brooklyn. Even on television, Baltimore provided the masterpieces of gritty crime series (Homicide and then The Wire). In this case, the killer had shot his girlfriend at a Baltimore suburb apartment building before heading to New York, and Baltimore had already seen a shooting of a policeman apparently motivated by the previous tensions over Ferguson and related incidents. More broadly, Baltimore is afflicted by everything that's wrong with the interaction of American urban and gun control policy. It's a poverty-stricken city in a state that attempts to implement gun control policies, but sits on the border of a state -- Virginia -- where the only question is how many guns per month you can buy. In turn, Baltimore is just a short day's drive up I-95 from Georgia, where there's an entire sub-industry that lives off allegedly local-use gun sales that repeatedly find their way into crimes north of the Potomac river. The Brooklyn shooter, Ismaaiyl Brinsley, was a Georgia resident with a girlfriend in Baltimore and connections in Brooklyn: the East Coast gun transit system ("Iron Pipeline"). Take, for example, the term U EJIT. A DMV [dept of motor vehicles] reviewer in California recently rejected it saying it sounds too much like the word that an Irish driver might blurt out to a motorist who cut him off (“You eejit,” meaning, “you idiot”). If only there had been a market-traded Soviet ruble to crash in 1979 when the USSR invaded Afghanistan and perhaps thus dissuade them from doing so, the world in general and Afghanistan and Pakistan in particular could have been saved a lot of trouble since then. What Windows just did when asked to "troubleshoot" a seemingly working Internet connection that wasn't working. ISLAMABAD, Pakistan — Taliban gunmen stormed an elite army high school Tuesday [in Peshawar] in a killing spree that claimed at least 141 lives — nearly all students — and brought defiant calls from Pakistan’s leaders to strike back harder against militants. It's not clear what "elite" means in a context where the army couldn't protect its own facilities and children, and the attackers apparently wore army uniforms. Now when you're dealing with terrorists, the likes of Al Qaeda or the ISIS, I haven't seen them water board anybody. What they did is cut their heads off. Fact: ISIS waterboards hostages, and indeed the orange jumpsuits that it forces them to wear are themselves a Guantanamo reference. [Cheney] We also have to work, though, sort of the dark side, if you will. We've got to spend time in the shadows in the intelligence world. A lot of what needs to be done here will have to be done quietly, without any discussion, using sources and methods that are available to our intelligence agencies, if we're going to be successful. That's the world these folks operate in, and so it's going to be vital for us to use any means at our disposal, basically, to achieve our objective. MR. RUSSERT: There have been restrictions placed on the United States intelligence gathering, reluctance to use unsavory characters, those who violated human rights, to assist in intelligence gathering. Will we lift some of those restrictions? VICE PRES. CHENEY: Oh, I think so. I think the--one of the by-products, if you will, of this tragic set of circumstances is that we'll see a very thorough sort of reassessment of how we operate and the kinds of people we deal with. There's--if you're going to deal only with sort of officially approved, certified good guys, you're not going to find out what the bad guys are doing. You need to be able to penetrate these organizations. You need to have on the payroll some very unsavory characters if, in fact, you're going to be able to learn all that needs to be learned in order to forestall these kinds of activities. It is a mean, nasty, dangerous dirty business out there, and we have to operate in that arena. I'm convinced we can do it; we can do it successfully. But we need to make certain that we have not tied the hands, if you will, of our intelligence communities in terms of accomplishing their mission. MR. RUSSERT: These terrorists play by a whole set of different rules. It's going to force us, in your words, to get mean, dirty and nasty in order to take them on, right? And they should realize there will be more than simply a pinprick bombing. VICE PRES. CHENEY: Yeah, the--I think it's--the thing that I sense--and, of course, that's only been a few days, but I have never seen such determination on the part of--well, my colleagues in government, on the part of the American people, on the part of our friends and allies overseas, and even on the part of some who are not ordinarily deemed friends of the United States, determined in this particular instance to shift and not be tolerant any longer of these kinds of actions or activities. Vox has a map showing "the 54 countries that helped the CIA with its torture-linked rendition program." Inexplicably, Iraq is not on it. Iraq is not only a documented rendition of at least one tortured detainee (Hassan Ghul), it also of itself became a raison d'être for the torture program, even though the war there bore no resemblance to the ticking bomb/attack on US scenarios that were being used to justify it. UPDATE: Deadspin's amusing list of 46 Vox errors doesn't include this one, most likely because Vox itself still has not corrected it. Remember that this was all about getting intelligence on who was then the latest designated super bad guy in an overseas war that was going badly. Having let torture out of the box to prevent another 9/11, it was being used as part of the unnecessary war in Iraq. The futility is brought into even starker relief by recalling that ISIS -- the new designated super bad guys -- are the descendents of Abu Musab Al Zarqawi's group. Ireland 2008-2010: Official legal advice says we can't put the banks into bankruptcy because there might not be enough money left in liquidation to pay all the depositors who rank equally with senior creditors. Ireland 2014: Official legal advice says that bankruptcy may be so effective in recovering value that even after all senior creditors are made whole, some speculative subordinated debt holders may see profits, especially if they bought in when values were depressed by the previous legal advice. Incidental observation: the junior bondholders who might make money on the bankruptcy recovery are the ones who successfully challenged Ireland's legally-advised attempts to restructure its banks outside of bankruptcy. The latest development shows that Ireland always had a credible threat to put the banks into bankruptcy, and therefore extract better terms from its bondholders than it actually got with one hand tied behind its back -- by its own lawyers. We can only -- I’ll speak for myself, I can only imagine how Luke’s [Somers] parents feel today. Murdered in the second attempt, came so close. This is a despicable crime. And we mean what we say when we say from -- speaking for the intelligence community, the military, the government as a whole, we will be relentless in our efforts to bring to justice those who have caused -- some already have been brought to justice in the raid. But there’s much more to do. It’s a tragic reminder of the violence we face in the Middle East and a potent reminder of what Israelis face every day. Israelis face al Qaeda hostage taking every day? Memorandum of Understanding on SPECIFIC ECONOMIC POLICY CONDITIONALITY November 28, 2010 .. In advance of the introduction of water charges The government will have undertaken an independent assessment of transfer of responsibility for water services provision from local authorities to a water utility, and prepare proposals for implementation, as appropriate with a view to start charging in 2012/2013. That’s the nature of war. A country doesn’t get to run around for years wallowing in war glory, invading, rendering and bombing others, without the risk of having violence brought back to it. Rather than being baffling or shocking, that reaction is completely natural and predictable. The only surprising thing about any of it is that it doesn’t happen more often. Er, actually that's Greenwald on what was an apparent lone-wolf terrorist attack a couple of months in Quebec. He hasn't said anything about the latest Chechen spectacular. Which is sort of interesting, because for all the analysis of Islamist terrorism which says that it's all just US foreign policy coming home to roost, the same theory applies ten times over to Russia. It was Russia as USSR which invaded Afghanistan, spawning the original Al Qaeda. And it was Putin's Russia which flattened Grozny -- twice! -- which sustained Chechen extremism, and it's not incidental that Chechens form an important element of ISIS. And who knows that fun is emerging from the petri dishes that Russia has created in eastern Ukraine and Syria now. And we’re announcing a new Sovereign Wealth Fund for the North of England so that the shale gas resources of the North are used to invest in the future of the North. Just like how Scotland got a Sovereign Wealth Fund so that oil resources of Scotland were used to invest in the future of Scotland! Also, is the North of England sovereign now? A couple of days after Egypt's Supreme Court struggled with the question of who was in charge of the country when former president Hosni Mubarak was president, their lower court colleagues have found that 185 people are collectively responsible, and subject to the death penalty, for the death of 12 policemen. Venezuela Finance Minister Rodolfo Marco is in China this week seeking loans from the Asian country, which has already extended the South American nation nearly $50 billion in credit since 2007. Mr. Marco will next head to allied Iran and Russia also in search of financing, Mr. Maduro [President] added. So the country's big plan to deal with economic mismanagement and falling oil prices is to look for loans from countries with ... economic mismanagement and falling oil prices. It's revealing that GM has dropped any pretense that large SUVs such as their Sierra Denali are for rugged individualist Joe the Plumber working class types and are actually for super-rich Americans who need a vehicle that can tow their luxury speedboat while providing the same sense of interior luxury as that speedboat.